Saucony's marketing pitch: Delivers a plush and supportive ride. Surfaces tested on: Road, ambient temperature of 24° C/75° F.
Upper: Mesh, fused Flexfilm laminate, welded urethane, synthetic leather. 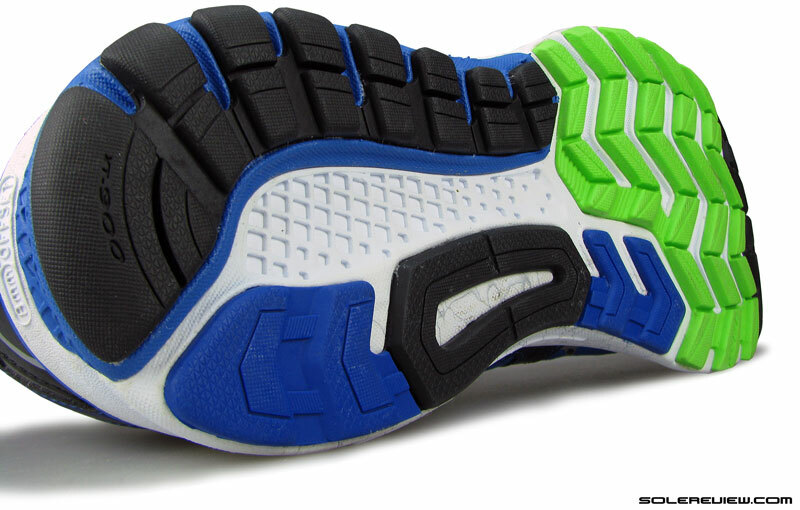 Midsole: Triple density compression molded foam with firmer medial post. 8 mm heel drop. Outsole: Hard carbon rubber under heel and toe tip, softer blown under forefoot. 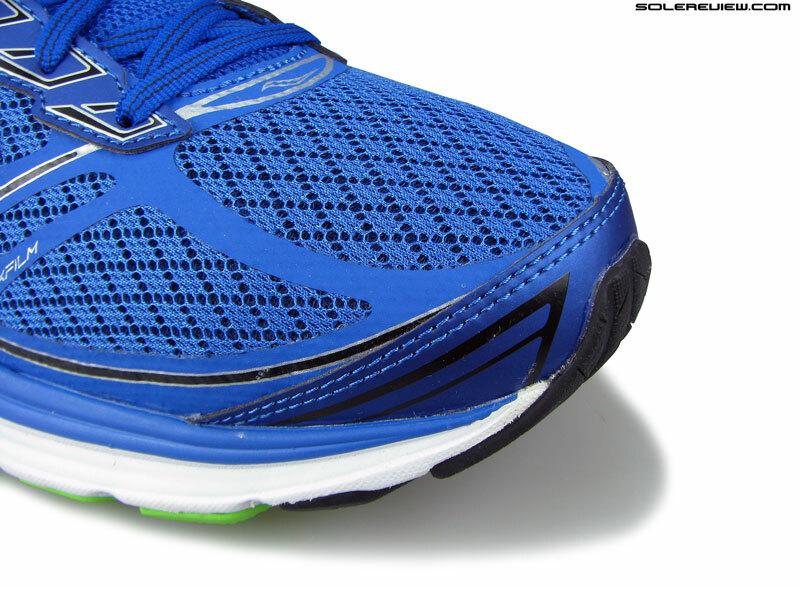 The Guide gets better with a responsive Everun topsole and an improved upper. The Guide 9 is here, equipped with Everun foam. Before you get too excited – Everun resides inside the Guide in a pared down, ‘topsole’ arrangement. We’ve often said that a running shoe is a sum of parts, and the way a shoe rides depends on how these parts function as a whole. Let’s take Saucony’s Everun material for example. The Guide 9 uses Saucony’s latest cushioning tech in a ‘topsole’ configuration. 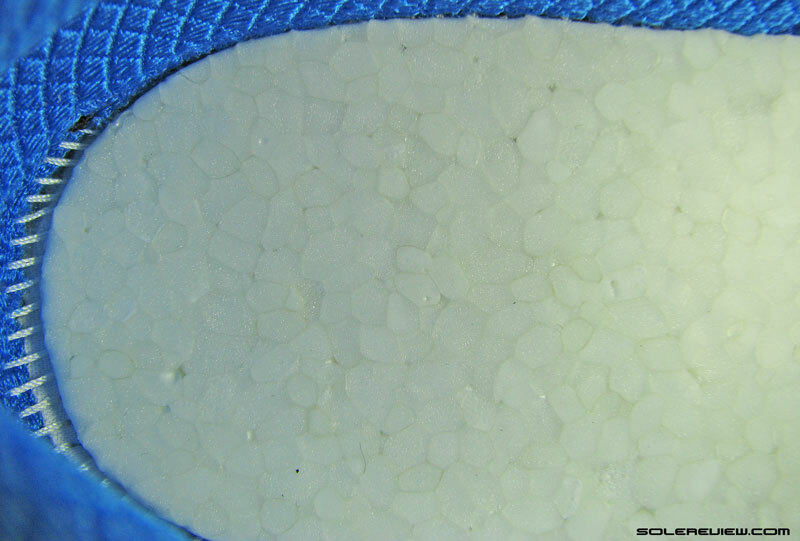 In English, it means that there’s a thin sheet of this new foam placed over the midsole and under the insole. The Triumph ISO 2 used a lot more Everun, and yet somehow it didn’t feel as responsive as the Guide 9. 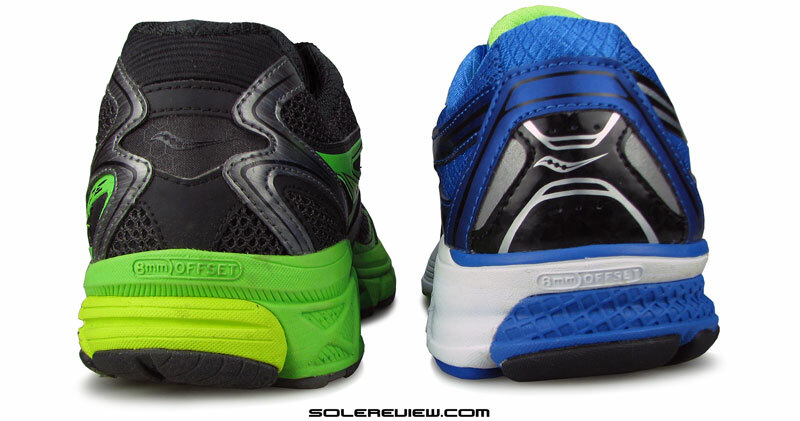 Here’s a good example of how the efficacy of Everun depends entirely on how the overall midsole is designed. 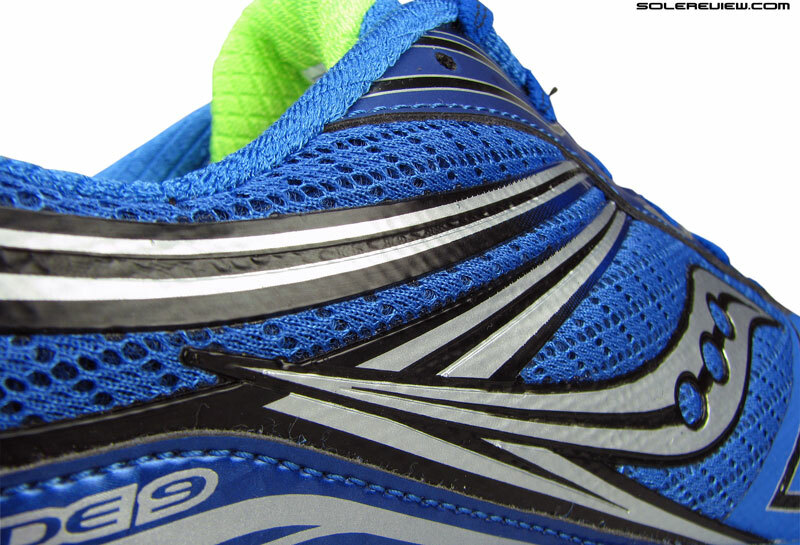 Our first encounter with Saucony’s new tech was on the $150 Triumph ISO. That shoe not only had a topsole, but the midsole was augmented by a gaudily painted crash pad made of Everun. And despite the Triumph ISO2 having a larger volume of Everun compared to the Guide 9, it is the latter which does a better job at isolating the Everun experience, and not the Triumph. How does that happen? To understand this effect better, let’s picture a rectangular piece of memory foam, large enough for both your feet to rest on. If you place the piece of foam over your mattress and then stand on it, then the chances are you are less likely to feel the foam piece as separate cushioning system. Now take the same piece of memory foam and place it on hard floor. Now when you stand on it, you’ll be able to isolate the effect of the foam better. 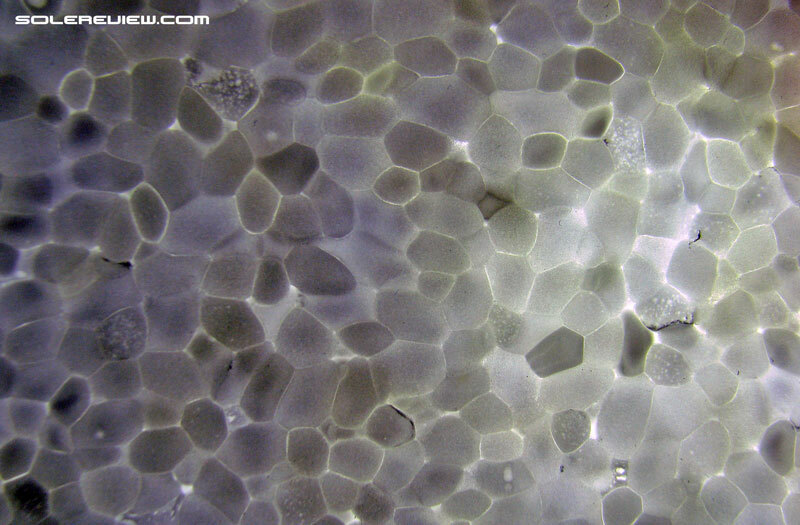 This occurs because there is a huge difference between the densities of the hard floor and the soft foam. Under these circumstances, the foam ends up being the easiest to compress of the two, and hence you get the full benefit of the foam. This is unlike the first example, where the mattress comes with inherent cushioning properties. So what you get there is both the foam and mattress working together, and hence the process of isolating the memory foam’s cushioning sensation becomes a difficult task. The Everun is overlaid on top of a firm, triple density midsole. This analogy applies to the Saucony Triumph ISO 2 and Guide 9. The ISO has a soft EVA midsole, so along with the topsole sheet, the rest of the midsole tends to cushion bodyweight as well. So while the Everun insert is doing is job, it doesn’t feel as responsive – it gets blended into the rest of the midsole softness. 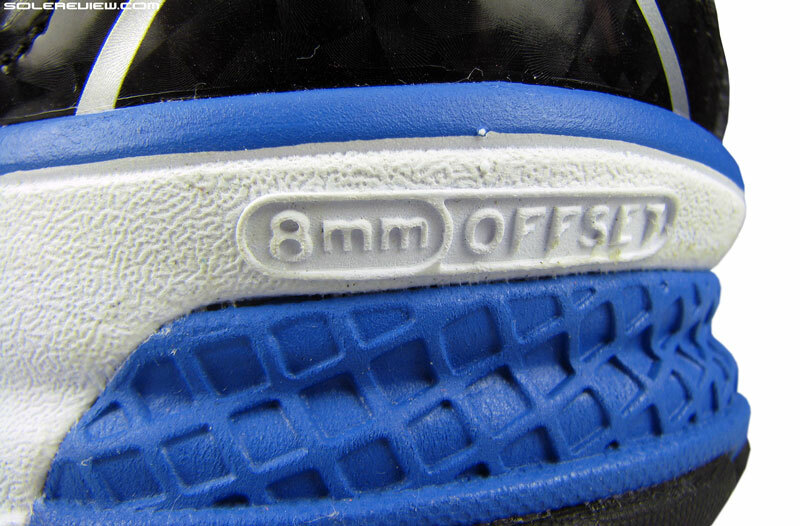 In contrast, the Guide 9’s midsole is very firm, a result of a hard medial post and overall higher density than the ISO. 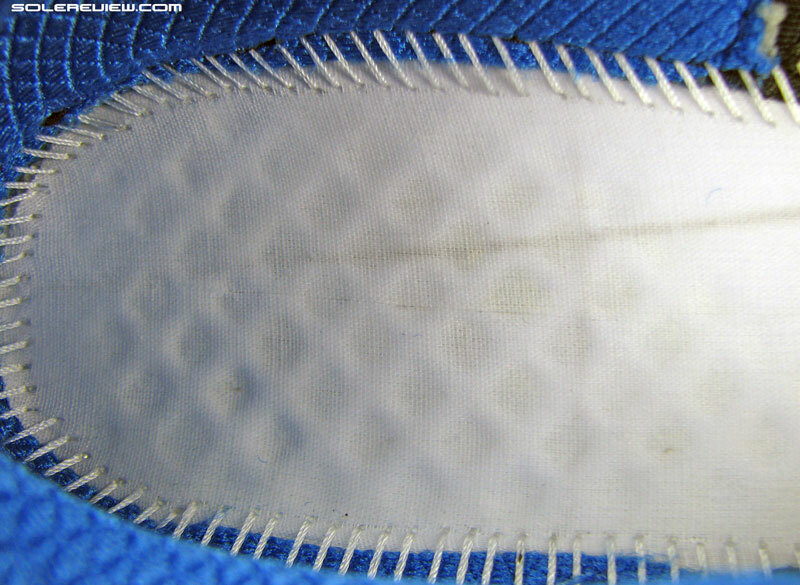 The firm midsole is more resistant to compressing than the ISO. 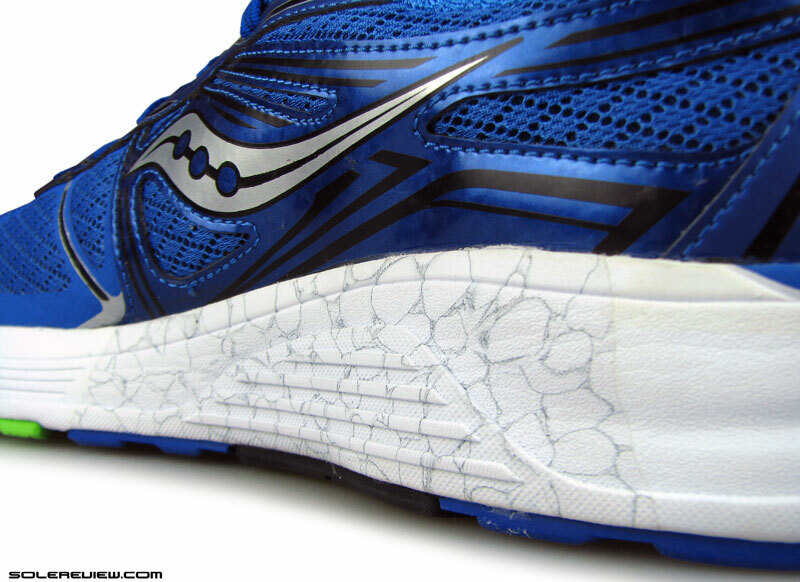 Hence, the softer Everun and insole ends up producing a marked cushioning effect. 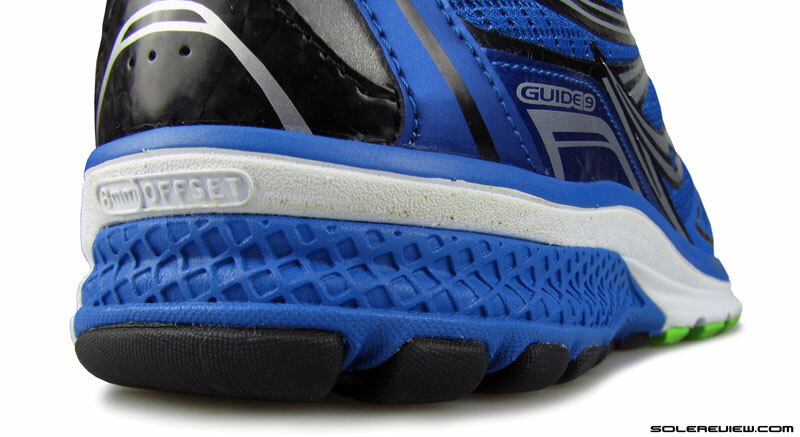 Refer to the firm floor and foam example here; the firmness of the Guide 9’s midsole allows the Everun insert to work its magic much better. We’ve done miles in the ISO 2 and the Guide 9; and we’re of the opinion that the Guide 9 feels much more responsive to run in than the ISO. The Triumph ISO on the other hand has more padding, but then that isn’t the same thing as responsive. 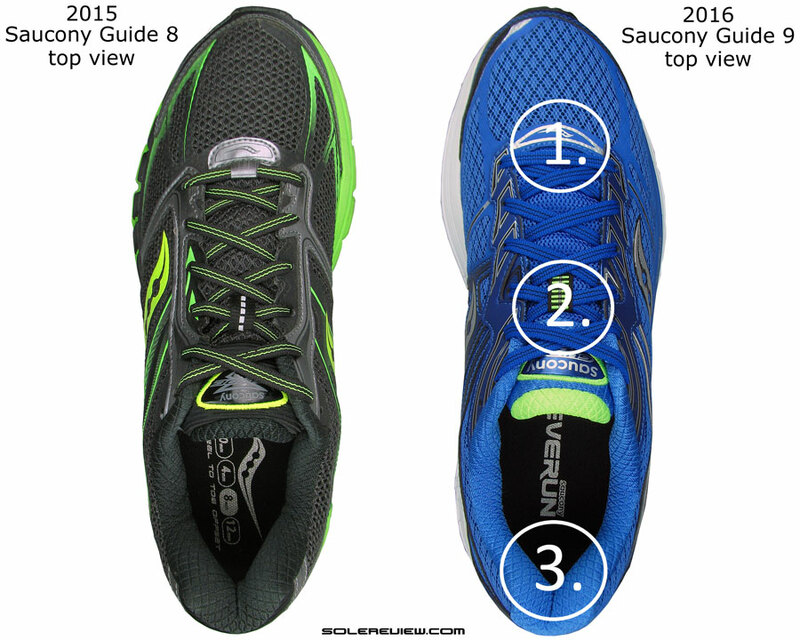 In our review of the non-Everun Guide 7 and 8, we talked of those shoes as having a near neutral ride behavior, regardless of the medial posted construction. After running in the Guide 9, we maintain the same position – that the Guide has a broad appeal to most kind of runners, including those who prefer their shoe without a medial post. Actually, the neutral manners are more pronounced on the Guide 9 than it was on G-8 and 7. 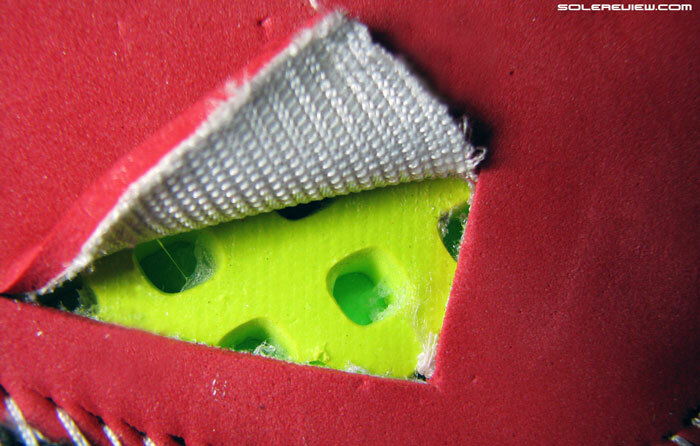 To know why this happens, deconstructing the midsole design helps yield useful insights. The formulation is very adidas Boost like, except that Saucony serves it up in thin slices. ‘Topsole’ is an apt description of the Everun insert, because it happens to be exactly that. 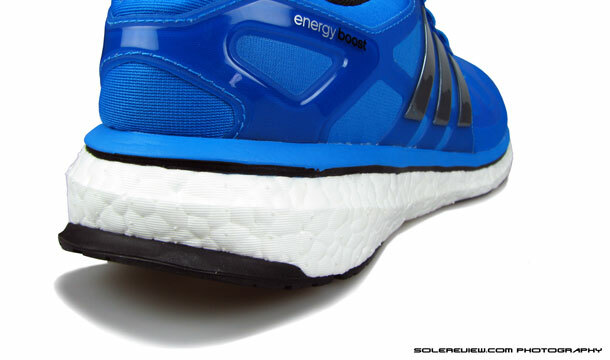 Everun is clearly inspired by adidas Boost tech, which basically involves co-molding a colony of Polyurethane globules. This unique molding of the resilient Polyurethane compound ends up giving the Boost foam its hallmark ride quality. 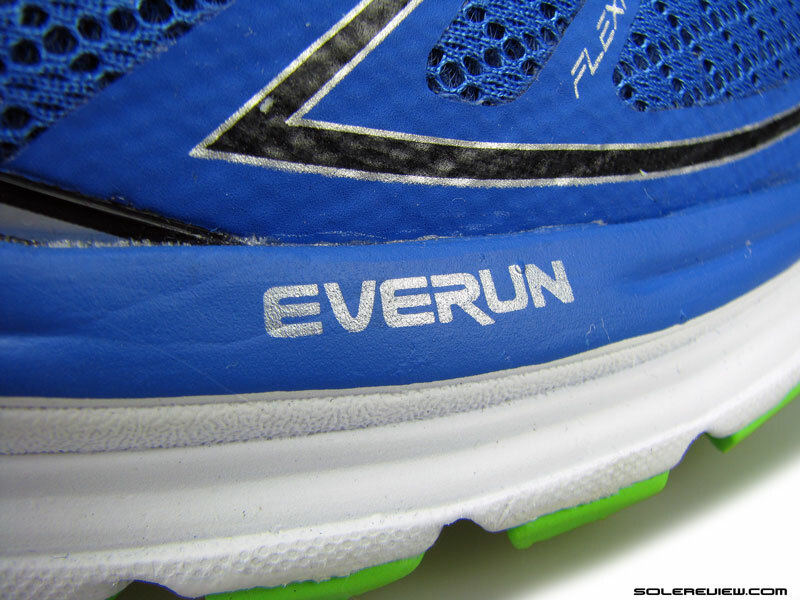 The Everun is called topsole because it sits above the midsole, and below the insole. Not very thick, is it? 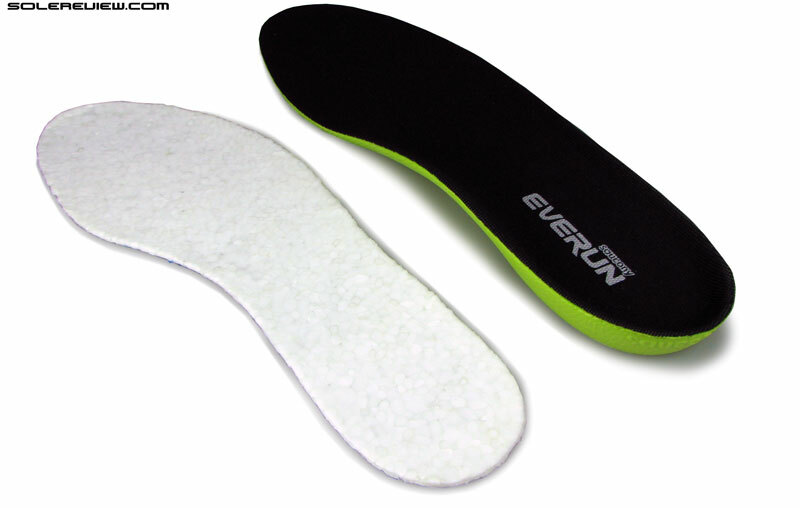 The insole is compression molded EVA foam, and has an updated design. But instead of a full midsole like how adidas does it, Saucony’s version is literally thinned down. It is akin to a thin slice of an adidas Boost midsole, and this slice is placed over the traditional foam midsole and just beneath the removable sockliner. Hence the ‘topsole’ moniker. The rest of the midsole is similar to the Guide 8. There is some change in the sockliner design, and this year’s component looks closer to the kind used on the Triumph ISO 2. The base material is still compression molded EVA foam, but the perforations (holes) present on the Guide 8’s insole has now been filled up. The medial/inner side has a firmer medial post. There is a crash pad on the lateral/outer side. Unlike the one seen on the Triumph ISO 2, this one happens to be made of EVA foam. Here’s a closer view of the foam crash pad. 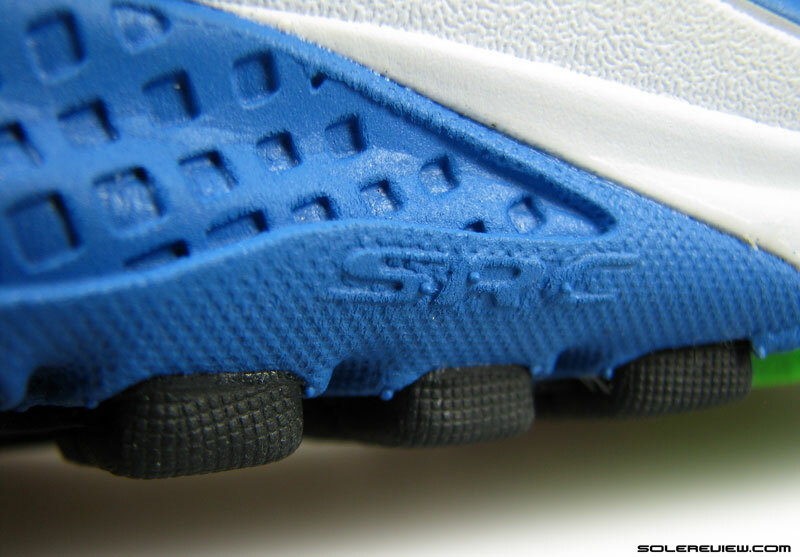 There’s a firmer medial post on the inner side of the midsole, and a non-Everun, SRC foam crash pad on the outer side. This is same as what’s on the newest Ride 9, except that the foam is much firmer. One of the new additions (or elimination if you will) has been the midfoot area, which is now bereft of the plastic shank. Instead, the midfoot has been filled up with foam, and underneath all that are pieces of outsole rubber joining the forward and rear sections. This perhaps, has helped the Guide 9 shed some weight. But not by much; the G-9 is just 4 grams lighter than the shoe sold last year. Beyond that lasting lies the impostor Powergrid+. The addition of Everun means sayonara to the old faithful Powergrid foam insert seen on legacy models of the Saucony Guide and Ride. 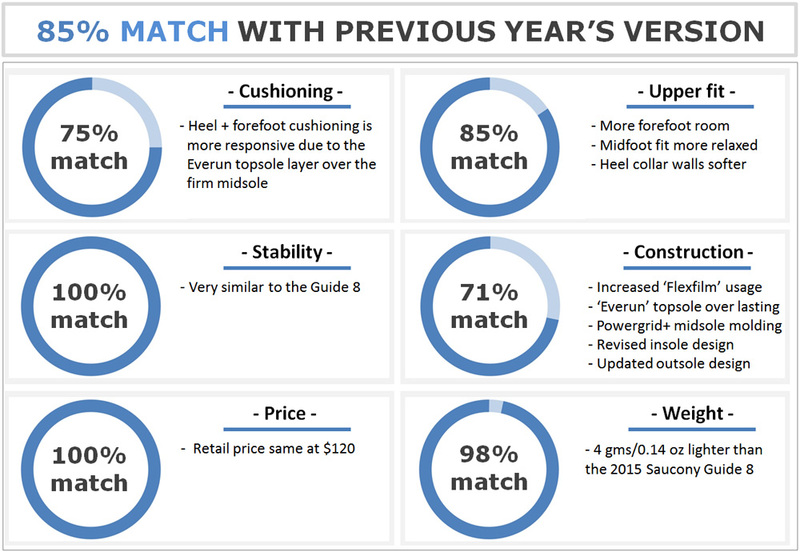 Instead of Powergrid, Saucony has molded the main midsole with a faux Powergrid+ pattern – a so called ‘cushioning technology’ which solereview trashed in the Triumph ISO 1 review. 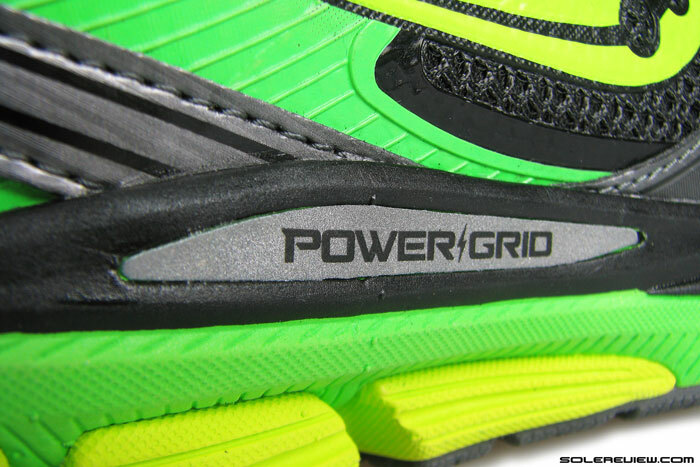 It is telling that Saucony has completely left out mentioned ‘Powergrid+’ on the Guide 9’s product page, which speaks volumes about how they feel about it too. The Everun topsole sits atop the midsole, making the stack heights taller. It is all this above which the Everun rests on, and that accomplishes two things. One, it comes into its own over the firm midsole, delivering a responsive ride. 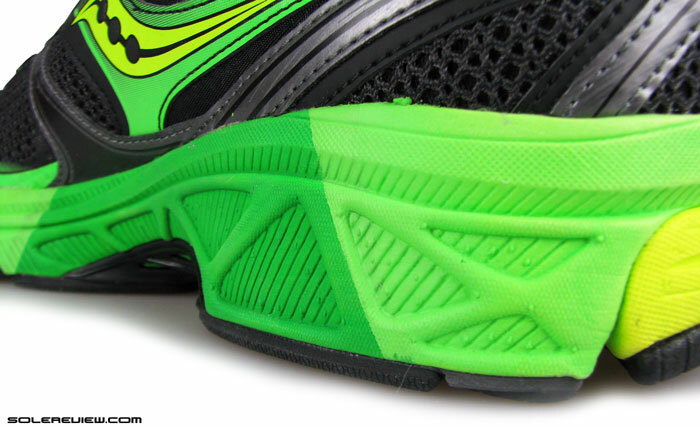 Secondly, the Everun separates the foot from the dual density effects of the lower midsole. This aspect ’neutralizes’ the already mild motion control properties of the medial posted midsole, making the Guide 9 feel more neutral than the prior two versions. 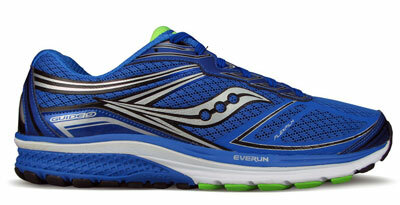 Saucony’s own specs confirm the increased midsole height on account of the Everun insert. In the women’s version, the Guide 8’s stack heights are listed as 18 mm (front) and 26 mm (rear). On the womens Guide 9, that is increased by a millimeter. Frankly, the height felt at least a few millimeters taller based on our experience, but there’s no denying that the Guide 9 has a thicker midsole. So basically, the Everun distances the foot from the triple density drama going on below it, so the Guide 9 feels a lot neutral than before. An important thing worth mentioning is that the Everun sensation is only experienced when in running motion. This is a well known characteristic of the adidas Boost foam as well, and since the Everun is cut out of the same cloth, it displays similar behavior. 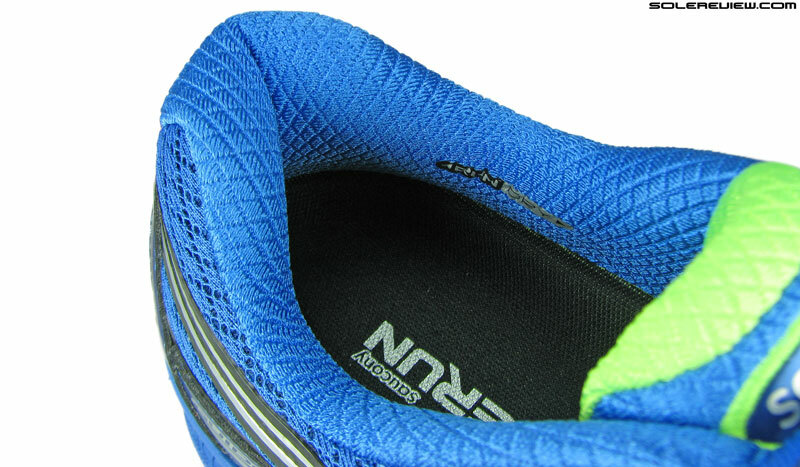 The responsiveness of the topsole becomes apparent on impact and quick weight loading, be it the heel or forefoot. It is highly unlikely that you’ll get the same feedback by just walking around in the Guide 9. 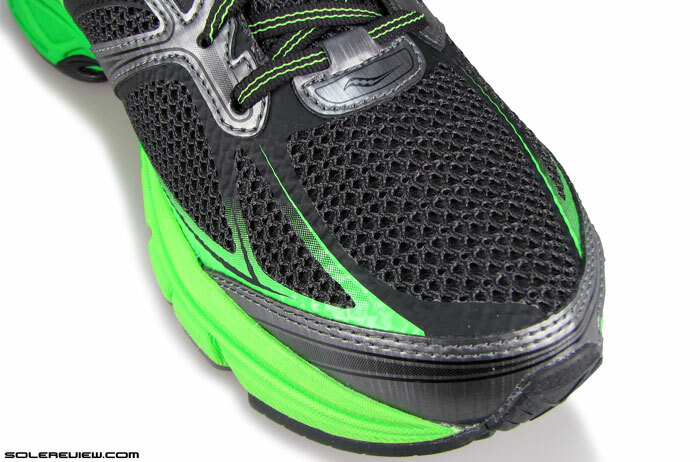 The dual combination of Everun and EVA insoles makes the shoe smooth to run in. The topsole does add a consistency of ride. The insole+Everun combo smoothen outs any differences in the midsole foam densities below it, and delivers a smooth transition. 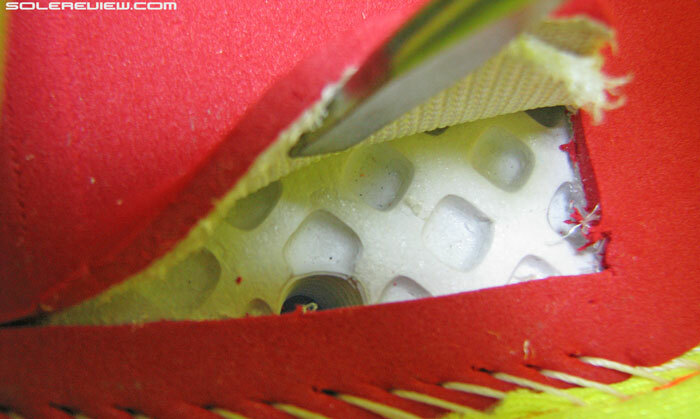 That is helped by the filled-up midfoot too; remember what we said about the shank being replaced by foam and rubber? The outsole basics hasn’t evolved a lot. The bottom relies on the legacy design of pairing harder rubber and softer blown rubber materials together. The heel, midfoot and toe tip gets the more durable rubber, whereas the wide flared forefoot is covered with blown rubber. 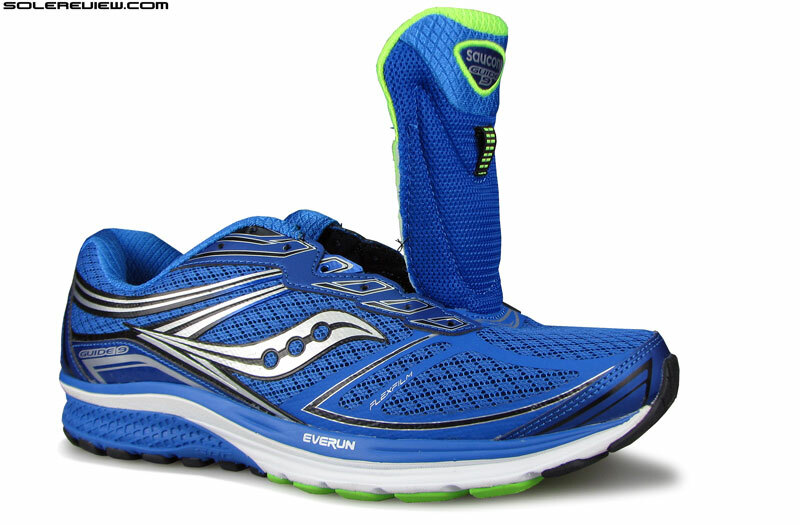 The wide flare is characteristically Saucony, and it makes the front very stable during either landings or transitions. Barring the Everun and insole part, the rearfoot is very firm, so the ride is overall supportive – and all that comes without a noticeable amount of sideways lean/bias. The Guide 9 has a deeper and wider (in white) transition groove. 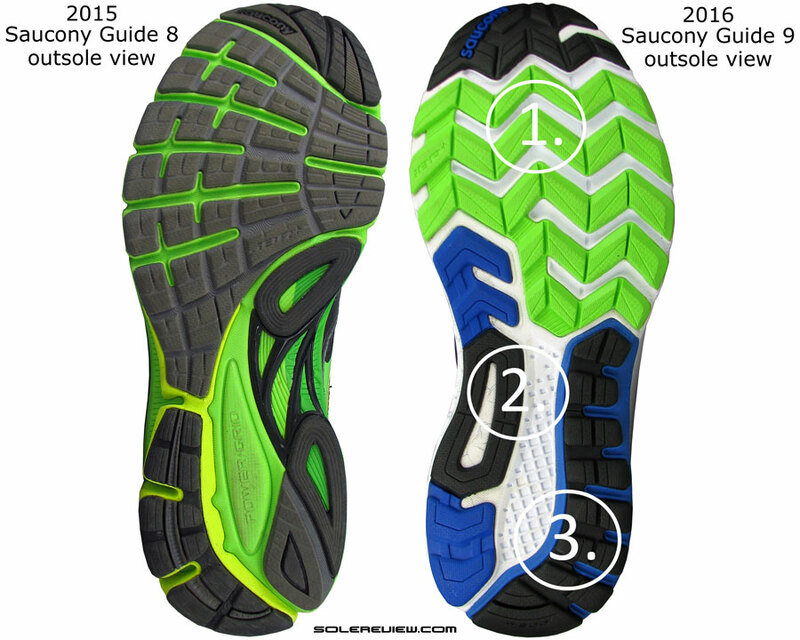 Saucony has changed the outsole geometry, though. Under the rear the central groove is deeper along with differently design rubber slabs. The forefoot gets a new forward facing Chevron aesthetic which the brand calls ‘Triflex’. We did not find that design change to influence the ride a lot, it is just that visually it tends to look cooler. 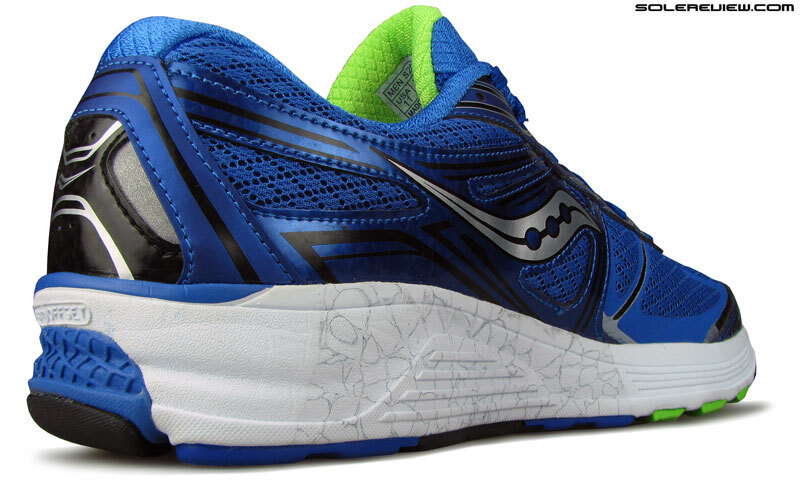 First made popular by the Kinvara, Saucony’s name for its stitch-less overlays is fast becoming ubiquitous. The lace-straps are still built using stitched-on synthetic; the semi-elastic flat laces pass through them. 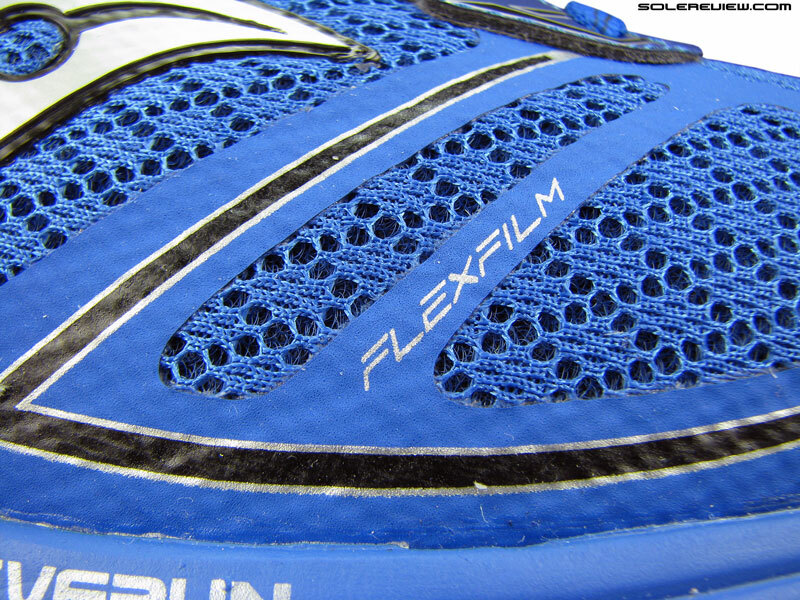 The fused ‘Flexfilm’ was also used on the Guide 8, but on the 9 it becomes a bit more obvious. 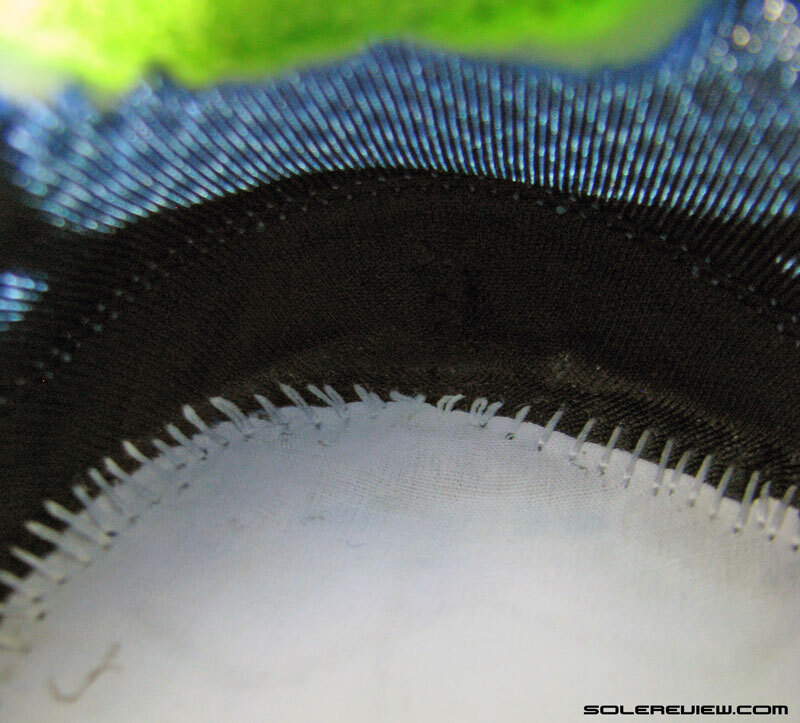 Many parts of the shoe are still stitched over in areas such as the toe-bumper, the lacing panel and the heel sides. But sections such as the forefoot sides and top is now layered with the thin film, a move which gives the Guide 9 a cleaner aesthetic, notwithstanding the overall sense of design familiarity. Fused urethane strips are a familiar sight, being modeled on the Guide 8. Other bits borrowed from the Guide 8 would be the welded urethane Saucony logo, and extensions made of the same material covering the mid and rear upper. The laces are flat and stretchy, though we found them slightly longer than needed. The same tongue lining as the past two Guide versions. 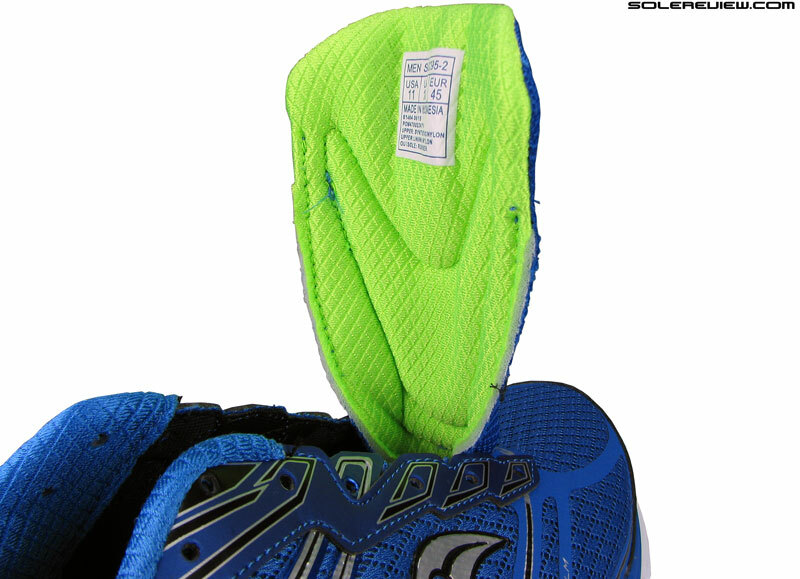 Identical Rundry heel lining and foam filling. The edges are softer however owing to a small change described in the next photograph. The tongue and collar lining and foam fill levels of the Ride and Guide has never been lacking, and the G-9 uses the same material package. A similar outcome follows, meaning that the fabric feels nice to the touch and both the tongue and heel are comfortably padded. The G-9 does come with a small update around the heel area. Notice the upper edge, where the synthetic on the Guide 8 (left) extends upwards. The Guide 9 does no such thing. Two straps of synthetic flanked the sides near the edge on the Guide 8. This lent a slightly firm feel to the fit. The Guide 9 does not have these pieces of synthetic, so the entire collar feels softer around the foot. Also, instead of two different kinds of fabric used at the top, the Guide 9 uses only one – hence getting rid of the turned seam. This update also contributes to the collar’s softer feel. 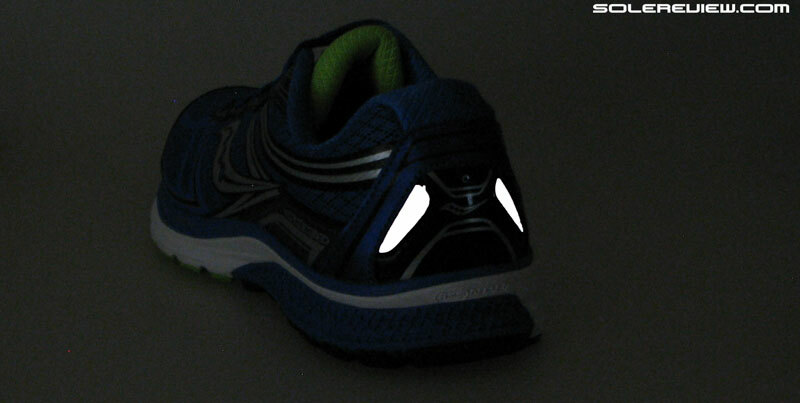 The heel retains reflectivity, though the midfoot isn’t so fortunate. Area for area, reflectivity is slightly lower on the Guide 9. The sliver present on the Guide 8’s midfoot side isn’t there anymore, and heel trim has been rearranged a bit. However, in our view this is a non-issue as there’s still adequate material on the G-9 to go around. With these updates, has the upper fit of the Guide 9 changed? We covered the heel area, but what of the forward sections? While the toe-bumper is still a piece of synthetic stitched over the mesh, it’s been cleaned up visually. There’s a slight increase in space inside the toe-box and forefoot in general. There is a difference in fit, and we’re not talking sizing. That stays true, as it was on the Guide 8. The affected areas are the toe-bumper and the forefoot sides+top where the shoe fits better. 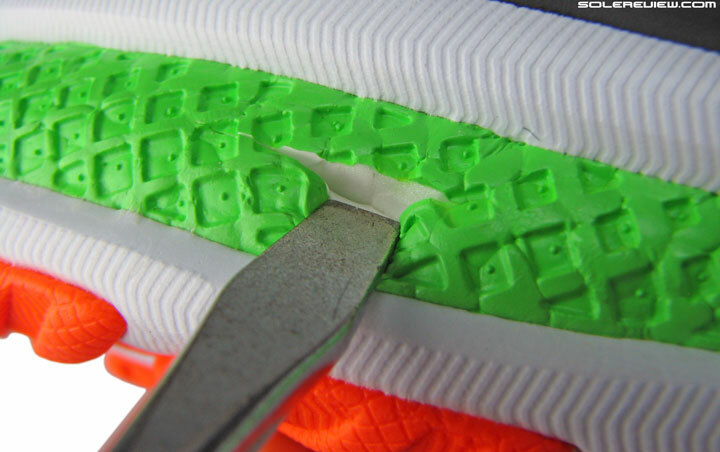 By removing the Guide 8’s synthetic lace-loop and replacing that with Flexfilm, the upper does not press into the foot while the shoe flexes. Also, with the updated toe-bumper and Flexfilm design, there’s a sense of greater space on the side of the big toe. All in all, the Guide 9 has a fit quality which feels very consistent from heel to toe without any overtly narrow or wide spots. By now, you must have gathered that the Guide 9 is a better shoe than the G-8. The ride is improved, going from just ‘firm’ to ‘responsive cushioning’ for no additional cost. It also has a neutral persona which will work for most runners. The Guide 9 reminds us of the excellent adidas Sequence 7 and 8, which had a similar character. 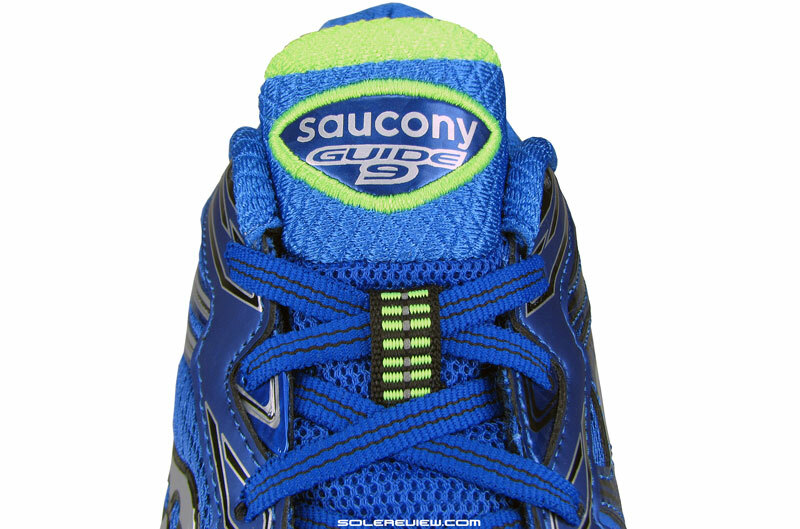 If the Saucony Guide 9 did not have tongue slide, solereview would have bestowed upon it a higher score. We would have easily given it a 91%+, but the Guide still needs a tweak or two. For example, how about adding a sleeve or gusset to keep the tongue in place? In its current set-up, there’s considerable sideways slide. If you can look past that, then do consider the Saucony Guide 9 if you’re looking for a supportive shoe with some amount of responsive cushioning. 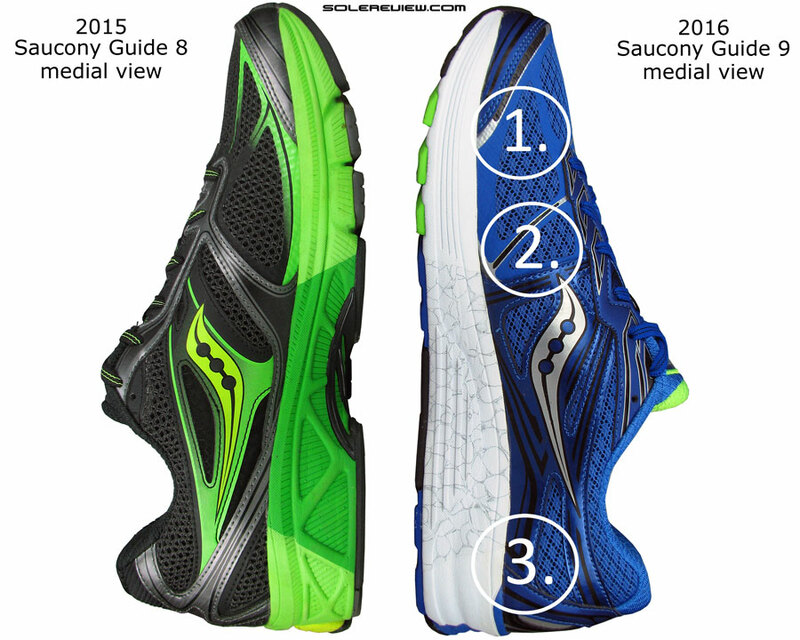 Out of the three Saucony Guides we reviewed so far, the 9 is the best of the lot. 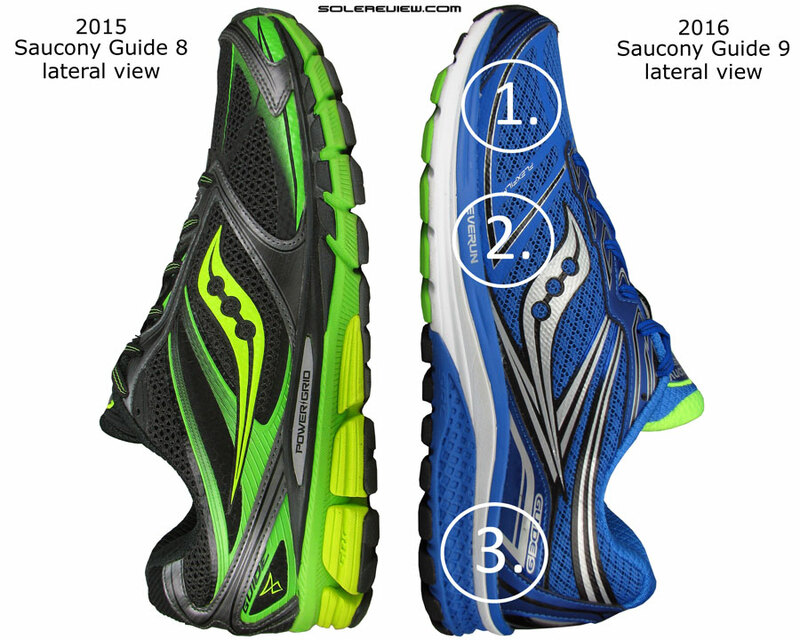 Looking to upgrade your old 2015 Saucony Guide 8 to the latest version, but not sure how the 2016 model compares? We can help here. The following infographic is a ready-reckoner for what changes you might expect in the new model vs. old. To make this more fun, we’ve put in a system of percentage match, which calculates a weighted average for a set of attributes.